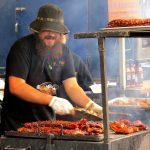 The 4th Annual Comox Valley Ribfest will take place this weekend from Friday, September 14 to Sunday, September 16 at the Comox Valley Exhibition Grounds. This popular family-friendly event promises to be better than ever! Proceeds will help support some of Strathcona Sunrise Rotary Club’s many local and international projects. Four award-winning professional cooks are returning once again to tempt your tastebuds with their delicious offerings: Gator BBQ, Misty Mountain BBQ, Boss Hogs BBQ and Prairie Smoke and Spice BBQ. Several other vendors will offer a selection of tasty food items including some fabulous vegetarian options – like fresh local corn from Sieffert’s Farm, potato tornadoes and deep-fried dill pickles! A Kid’s Zone will keep the little ones entertained, and car enthusiasts won’t want to miss the Classic Car Show on Saturday from 10 am to 3 pm. A new recycling initiative designed to help organizers of community events improve their waste diversion strategies will be launched at the event. Members of Strathcona Sunrise Rotary’s Green Team have been working with staff from the Regional District and Exhibition Grounds to create colourful signage and set up collection areas at locations throughout the grounds. Volunteers, including a number of enthusiastic members of the local Girl Guides’ Pathfinders group, will be on hand to make “Going Green” interesting and informative for everyone – and suggestions, feedback and cooperation will be welcome! Hours of operation are: Friday 4 pm to 9 pm, Saturday 11 am to 9 pm and Sunday 11 am to 6 pm. Admission is by donation so be sure to look for the big pink pig at the entrance!